The seat my Honda CX500 came with looked like this when I got it, except with black tape wrapped around the back. Not only damaged, but uncomfortable for someone my size--I needed to slide back a few inches, but the hump between the driver's and passenger section prevented me. 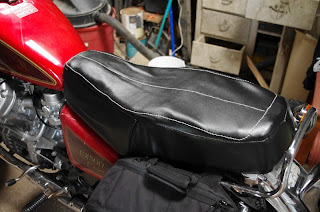 I re-shaped the seat with a bread knife, and added a bit more padding to the front section. The first attempt at a cover looked awful, barely better than what was there before--but it was a good bit more comfortable to ride. The final version turned out quite a bit better. For the top I used 2 layers of marine vinyl with quilt batting between. I was originally going to sew ribs, but the back of the vinyl had this diamond pattern in it, so I sewed along that pattern. It needs to be touched up in a few spots--I've got a pucker that I need to tear out and re-sew, and 2 spots where a second line of stitching will close a gap. However, it is no longer the worst part of the bike, so I'll probably leave it for now. Wow! That looks really good. When I saw the original, I thought it looked pretty good for a first attempt, but your second try really hit the mark.